With a Senate vote looming on Republicans' long-sought tax overhaul aspirations, President Donald Trump gave the party's plan one final pep rally in Missouri on Wednesday as he urged Congress to deliver on a "once in a lifetime opportunity." His speech came one day after the Senate Budget Committee advanced the GOP-backed tax bill to the floor by a 12-11 vote along partisan lines. The success of the plan, which would reduce the corporate rate, winnows the number of tax brackets and would eliminate the individual health care mandate, hinges on Republicans' allaying the doubts of up to 10 their senators who have expressed misgivings. 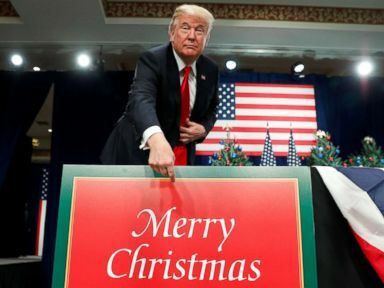 At the St. Charles Convention Center on Wednesday, Trump stood before a row of four decorated evergreens, flanked by signs reading "Merry Christmas," and sold the plan's merits to the crowd, saying it would "bring Main Street roaring back." Much as he did during his presidential campaign, Trump directed his message at middle-class workers. "Our focus is on helping the folks who work in the mailrooms and machine shops of America, the plumbers and the carpenters, the cops and the teachers, the truck drivers and the pipe fitters … all of the people who give their best each and every day to take care of their family and the country they love," he said. President Donald Trump points to a "Merry Christmas" placard on the stage as he arrives to deliver remarks on tax reform in St. Louis, Mo., Nov. 29, 2017. "This week's vote can be the beginning of the next great chapter for the American worker," Trump added. Democrats have decried the plan as one that unduly benefits upper-class taxpayers and increases the federal deficit at the expense of economic benefits for those middle- and lower-income citizens cited by Trump on Wednesday. All 48 Democratic and independent senators are expected to oppose the bill, in a vote that could come as early as Thursday. Trump has labeled their efforts as "obstruction." In light of the bill's lack of bipartisan support, he appeared to issue a warning Wednesday to the Republicans still determining their position on the matter. "Now comes the moment of truth," he said. ABC News' Alexander Mallin contributed to this report.